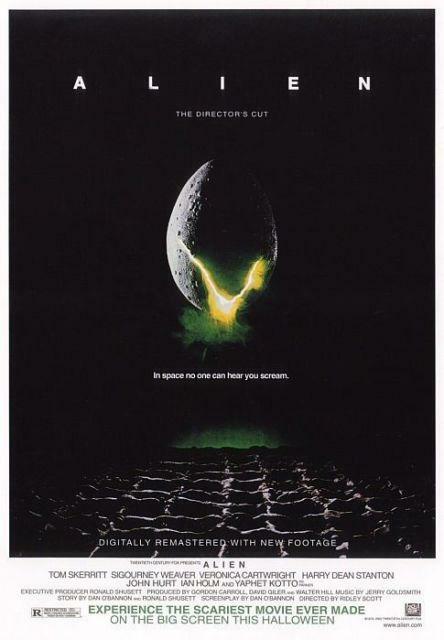 Believe it or not last night was the first time I have ever watched Alien (yes I had seen the popping out of chest moment) and I really cannot understand why I have not seen it before. I thought that it could easily be released today and it would still look like a top quality film. That has to be a massive compliment for a film released in 1979. It’s heart stopping, it makes you hold your breath and it makes you wonder what is going to happen next. It is a fantastic viewing experience from start to finish. It is visually stunning at times and the alien looks just brilliant. Plenty of times to jump (and probably scream in some cases) and wonder what’s going to jump out next. Ripley is our heroine and we cannot help but want her to beat the Alien and survive, everyone else seems to crumble around her. I am sure the underwear scene towards the end of the film was a favorite among the male watchers of this film. At that point in the film I really did have my heart in my mouth, I mean I knew she was going to survive with the film having sequels, but it was the whole wondering and waiting to see where and when the alien was going to appear. It felt that way throughout the film and it truly was just brilliant, waiting to be scared and made to jump constantly is the sign of a very good horror film in my opinion. I just couldn’t help but wonder why I had not seen this masterpiece before as it really has not aged at all. I would have loved to see it on the big screen! I liked the little added bonus of a robot on board the spacecraft as well, totally did not expect that at all. I actually thought he was going to be an alien! Another thing I couldn’t help but notice was how much trouble the cat caused, really you did not want to be anywhere near that cat. I think after seeing this Alien film I really do have some serious catching up to do with the other films as well!! !